BEIJING, China -- Years of underpaid social security payments and housing allotments have sparked the protest of thousands of Chinese laborers. The Yue Yuen factory in Dongguan is the global leader in shoe production, employing over 60,000. In the last month, manufacturing has halted. In many cases, various forms of compensation were simply unpaid to thousands who do the legwork for corporate giants such as Nike, Adidas, New Balance and Timberland. The violations of Yue Yuen range from outstanding salaries to mandatory, uncompensated overtime. All of these damages go against Chinese regulations, and are illegal, though apparently permissible. Until now. Officials are taking notice. But the response of the police and the corporation bear no resemblance. Yue Yuen executives have offered to increase compensation, but have failed to address the concerns over unpaid social insurance and unacceptable factory safety practices. The strike continues, as workers have witnessed this corporate song and dance for decades, with little lasting change. On the other hand, many protestors have been jailed since demonstrations escalated earlier this month. The organizer of the demonstration, Zhang Zhiru, has presumably been detained by officials, although his family has been unable to locate or speak with him. The subtext to these actions is that whistleblowers such as Zhiru will be silenced, as well as those who support the cause. According to An Open Letter to Adidas and Yue Yuen Dongguan, China, a representative for Yue Yuen stated "The misunderstanding has to be clarified by the government." In the wake of the mass incarceration of demonstrators, this statement is very telling. 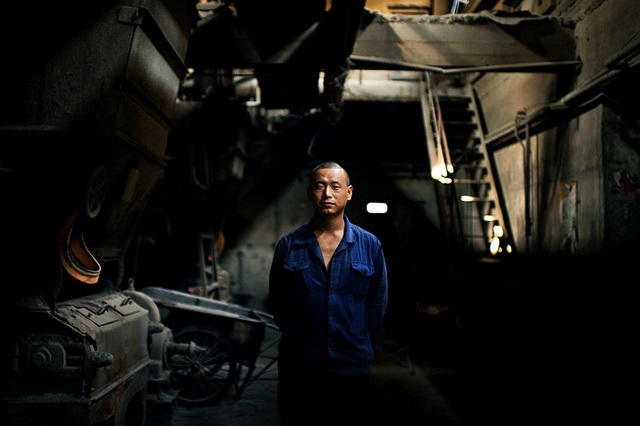 To Yue Yuen, "The misunderstanding" should be read as--the false impression that the voice of Chinese laborers factors into the dealings of the corporate powerhouse. The "clarification from the government" that Yue Yuen is waiting on will surely be the clarity that comes from the iron fist of an autocratic agenda. Much of the media attention has centered upon the disruption of sneaker production, as opposed to the people directly affected by the corporate bottom line. The Western discussion of the movement is more concerned with the potential supply fluctuation and securing stable factories, than with addressing the root problems. Chief among these are basic human rights. Businesses with the strength of Nike or Adidas should not participate with factories that skirt ethical and legal codes. But then again, it is not altogether surprising. That is how most retail titans gain tremendous market shares in the first place. Kiss Me, Kiss Me. Kiss Me Not! When I came back to the States from Africa in the late 70's, I was thrown into a school system and culture with which, like many people from different cultures and backgrounds, I was quite unfamiliar. There was the usual lack of cultural sensitivity that routinely resulted in children asking me if I saw tigers walking down the middle of the street, or if I "put a glass up under all those naked, exposed breast, to get my milk." It was offensive, but not necessarily hurtful. What did become painful were the taunts about my physical appearance. All children face ridicule at some point in their school careers. For some, the taunting, the desire to fit into whatever standard of 'cool' or 'beauty' of the day, and the incessant bullying, causes them to resort to harmful and often tragic measures in search of relief. I made it through, but not unscathed, as nearly 30-years later, I still recall how hurtful it was when classmates would point out that my lips were 'liver lips', 'big, ugly gorilla lips,' and that my mouth, like the vacuum cleaning brand Hoover, was a dangerous weapon capable of rearranging the face of any boy foolish enough to kiss me. We all have things that we would like to change about ourselves. I have mine. However, I have come to appreciate my lips, but even more than this, I have come to appreciate my healthy lips, body, mind, and spirit. That said, this post does not pass judgement on those who desire to change something about themselves, but only seeks to encourage due diligence, introspection, and self-awareness before embarking on a journey that can result in Don Quixote's madness of chasing down enemies that do not exist. We begin aging the moment we take our first breath, to do so with dignity is the greatest testament to a well-lived life. The video below should serve as a cautionary tale. NEW YORK CITY, New York - Once again attention is being focused on professional models and their struggles with body dysmorphia, bulimia, and anorexia. To be fair the initial push for models to strive to become ever thinner was driven by an industry that desired to use them in the truest sense as mannequins versus actual human beings. The women in the modeling industry are no longer emblematic of anything that most American women, indeed most women globally, could hope or want to achieve. The industry has strayed so far from functional fashion as to inhabit the milieu of performance art. The complicit victims of this macabre dance are the girls and women who model in a fiercely competitive industry which demands that they achieve a size “0” in order to grace the runways of the fashions centers of the world. Unfortunately, the diet methods used by women who are 5’8” to 6’0” ft. (176 cm to 183 cm) tall is appalling and extreme by any measure. Diet regimes include excessive use of laxatives; self-induced vomiting (bulimia), extreme caloric restrictive diets including those that eliminate all forms of carbohydrates which sometimes leads to (anorexia), and using medication prescribed for ADD/ADHD because it is an amphetamine that also suppresses the appetite. Then, there are some who try more drastic measures such as consuming illegal street drugs such as speed and cocaine, and more recently hCG (human chorionic gonadotropin), a hormone found in the urine of pregnant women. This product has not been approved by the FDA which has issued warning to manufacturers against its sale and use. There have been a number of high-profile deaths over the years. In 2006, Brazilian model Ana Carolina Reston, 21, died of anorexia on the eve of a Paris photo shoot after existing on a diet of apples and tomatoes.’ (Source: Daily Mail UK). In 2007 ‘Uruguanian model Luisel Ramos, 20, died of complications from anorexia. ‘Her sister Eliana Ramos, 18, also an anorexic model, died three months later from malnutrition. However, these guidelines are not enforced as designers strive to achieve the ultimate presentation of their designs at unimaginable cost to the models. Once someone develops an eating disorder and is body dysmorphic, the only way to treat the condition is with serious psychological intervention that includes overseeing food intake and supplements. This is definitely not occurring or enforced despite the fact that the girls present healthy meals and snacks to gain admittance. And unfortunately in the case of the deaths of the models above, the designers callously absolved themselves of any culpability by claiming that the women had preexisting eating disorders. However, there are some signs in the industry that designers who target their clothing to average women are attracting models that have been scouted because they are healthy and more representative of the population. It remains to be seen how long it will take for the industry to reverse this unhealthy trend, but it can only occur if there is a concerted effort by the female models to reassert their power and desire to control their bodies and their health. Let’s hope that no more models or the young girls who aspire to look like them die before this is achieved. Henna is traditionally used to mark important life events such as marriage. When most people think of henna they recall the designs such as those in the photo to the left. This type of design is a "Bridal Mehndi." In Africa, there is another more painful tradition of scarification; however, in regions throughout the world where Henna plants are grown and cultivated, women have used this plant for centuries to adorn themselves with exotic and beautiful designs, each as unique as the woman who wears them. ISTANBUL, Turkey - Often when people think of Turkey, a predominantly Muslim country, the idea of fashion does not readily come to mind. However, the 2010 Spring Season Fashion show in Istanbul, Turkey should have dispelled this misconception. Turkey has become the new centre of the East meets West fashion world. It has been prognosticated that within five years Turkey's fashion week could rival that of Paris, Milan, London, São Paulo, and New York; a trend which Vogue is capitalizing on with the issuance of a premier Vogue Turkey edition. What was most fascinating but not as well-known were the Islamic fashions that were featured during this week. Muslim women, especially those who embrace the Hijab which is both the head covering that traditional Muslim women wear and adopting modesty in dress, are often patrons and attendees of the Paris and Milan fashion shows. However, with the Turkey show, some designers decided to tap into this lucrative market by designing a line of clothes that were fashion forward but met the needs of conservative women who value modesty. What is often not known by Westerners is the fact that there are many extremely affluent Muslim women, particularly of Saudi descent, who shop, purchase and wear clothes from some of the worlds most exclusive designers. Clothes which are usually worn beneath the Burqa when in public but in private are clearly displayed with pride. The idea of modesty is not unique to Islam. In fact every Orthodox sect of the major religions (Judaism and Christianity) practice some level of covering for women. In Orthodox Judaism, Tzunit governs the conduct between women and men, the tenets of modesty, and dress codes for women. Part of Tzunit is the practice of covering one's head, particularly if married, since a woman's hair is her crowing glory and should be reserved for the enjoyment of her husband. Chaldean Catholic women among others cover their heads, and for conservative, traditional women of all three faiths, the issue of modesty, particularly when traveling to coed beaches and swimming pools remained a challenge until now. One of the fashions featured at the show was the "Burqini", a full body bathing suit that allows a woman to maintain her sense of modesty without restricting her movement in such a way that it would be difficult for her to swim. Bathing suits that provide the wearer with a level of modesty to which they have become accustomed are sold by a number of vendors such as Ahiida, and the swimsuit line by Stingray Bay was most appealing because they focused on all three faiths - Islam, Judaism and Christianity, as well as providing alternatives for individuals who need to cover for environmental and health reasons. In any case, the Turkey fashion show has challenged existing preconceptions of fashion, and informed the public about the diversity that exists among Muslim women. When a person has no roots, they cannot weather the storms of life. When a person doesn't know who they are, they will try to be anyone. When a person stands for nothing, they will fall for anything. Platitudes spoken throughout the ages, yet ever true even with repetition.